Foran senior defensive back Richard Piscitelli intercepts the ball from Wilbur Cross sophomore Donald Burris in the season opener in a Southern Connecticut Conference matchup Friday afternoon September 7, 2018, at Barbarito/Marone Field at the Wilbur Cross Athletic Complex in New Haven. Wilbur Cross won, 14-13. 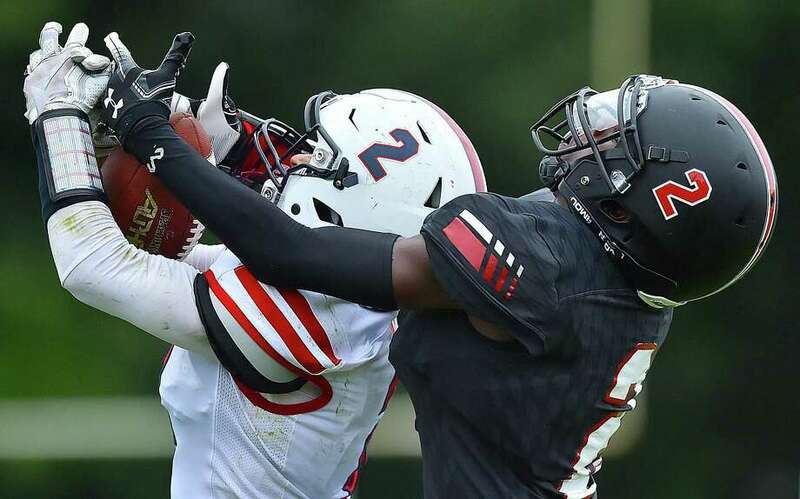 NEW HAVEN — It took the first quarter for the Foran and Wilbur Cross football teams to get in a rhythm in their season-open Southern Connecticut Conference Tier 2 matchup at Barbarito-Marone Field on Friday. While the passing game kicked in for the Lions in the second quarter for a 13-point lead, the arm and legs of Wilbur Cross quarterback Leshaun Hicks took center stage in a Governors’ comeback victory. Hicks had 15 carries for 157 yards, including a game-winning 74-yard touchdown run in the third quarter. He also completed 4-of-8 passes for 76 yards and a touchdown as Wilbur Cross hung on for a 14-13 win over Foran. Jasiah Barnes chipped in with 55 yards on 23 carries for the Governors. Trailing 13-8 to start the second half, Hicks bolted through a huge hole up the middle and went untouched for 74 yards and a 14-13 lead with 9 minutes, 10 seconds to go in the third quarter. The two-point conversion rush failed. “I knew I could get through their defensive line with the holes our offensive line players were creating throughout the game,” Hicks said. “On my big run, they opened a huge hole for me and I just went with the flow. As soon as I took off I knew I could score. Foran took a 13-0 lead when quarterback Andrew Janik connected with receiver Richard Piscitelli for a 50-yard touchdown and a Drew Izzo kick made it 7-0 with 11:05 to go in the second quarter. Janik completed a 27-yard touchdown pass to William Phelan with 5:21 to go in the second quarter for the 13-point lead. On the Governors’ last possession of the second quarter, Hicks completed a 42-yard touchdown pass to Enasj Jones. A Barnes two-point rush cut the Lions lead to 13-8 with 17 seconds to go in the half. “Our touchdown to close the second quarter was a big momentum changer for us,” Wilbur Cross coach John Acquavita said. “We showed some life in that second quarter and our kids showed a lot with how hard they played on offense and defense the whole game. Janik ended up completing 11-of-32 passes for 232 yards. Phelan had four receptions for 94 yards and Piscitelli had two receptions for 94 yards. Go Big Red Impressive Performance By Hicks Foran D Swarmed Barnes Like Most Others Will Plan To Do As well!!! Barnes Will Bounce Back Fine Now That ThedLegs Of The Cross QB are a Threat Just Need That Passing Game To Develop And Those Lineman To Block To The Whistle!!! Great Tough Win Governors It’s Gonna Take All Of You!! !